NBA Canada created this beautiful video sharing George Harvey Collegiate Institute’s student’s journey in creating murals inspired by words connected to the sport of basketball; along with 350 children and youth from 30 schools and community organizations who worked under the guidance of 16 professional artists across the GTA who followed the same journey in creating 60 distinct murals. The murals welcomed NBA fans and NBA All-Stars to Toronto for the very first time in all of Canada. The murals tell the story of how the game of basketball impacts the lives of many youth groups, and also the shared experiences between artists and basketball players. The 60 unique (4’ x 6’) murals were created on repurposed TTC advertising panels that are now original http://identyme.com/ShaiPreid works of art to be appreciated. You can read the Toronto Star article to hear what some Mason Road Junior Public School students had to say about their experience in creating the murals and seeing them in the 31 TTC subway stations. The artworks were created thanks to an exciting partnership with the NBA Canada, and PATTISON Outdoor Advertising. 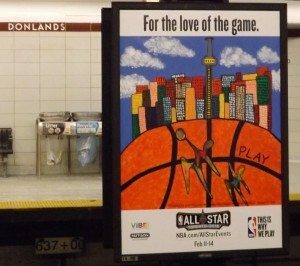 The hand-painted murals were on display in 31 TTC subway stations across the City of Toronto, at platform level from December 28, 2015 and will be there until the end of February, in celebration NBA All-Star Game 2016. See the murals before they are gone!